Hello! 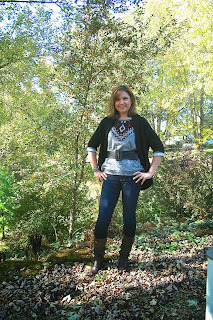 Today's post is all about two trends I've been noticing a lot of this fall and that's the Embellished Sweatshirt and Southwestern Prints. Now I don't think Southwestern Prints ever go out of style; it's a classic design element like blue and white; but they are really hot now! Many of you probably already own a Southwestern sweater or shirt and won't have to go out and buy one like I did. I found mine at Forever 21. I believe this sweatshirt is meant to be worn large and baggy as shown on the model HERE, but when you are over fifty, large and baggy clothes just make you look fat and frumpy, so I bought a size small and even cinched it at the waist with a belt to make it more tailored. If you've been reading all my Fashion Over Fifty Posts, I shared HERE another embellishment sweatshirt which had jewels around the neckline. Embellished Sweatshirts are a way to be comfortable, yet still feel a little more dressed up. They can have fancy stitching and embroidery like the one I'm wearing below, or covered in jewels and sequins, and I've also seen a lot with lace....that's really pretty! I wore a chunky knit black cardigan from Express over my embellished sweatshirt, skinny jeans which are also from Express, and dark brown boots from Famous Footwear. All these items were purchased last year, so sorry, no links.